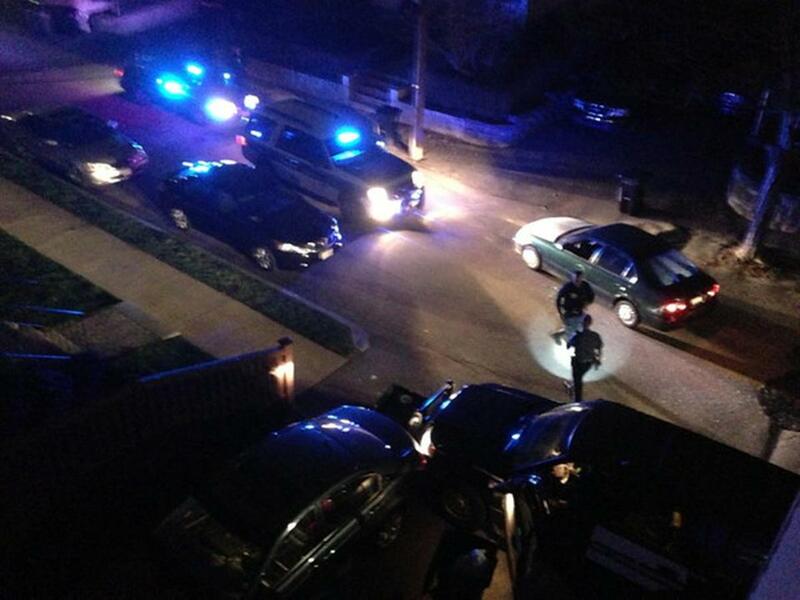 In this image, taken April 19, 2013, from a nearby residence, officers rush into the street as soon as a black SUV driven by Dzhokhar Tsarnaev left the scene of the shootout. This week, as the 2014 Boston Marathon draws near, memories of suffering and heroism surely dominate the minds of everyone in the city and region. Responses to the public safety challenge presented by the search for perpetrators, however, were far from flawless. Police officers made major mistakes in the use of weapons during the hunt for the Tsarnaev brothers in Watertown. “Why Was Boston Strong?” — a report by the John F. Kennedy School of Government at Harvard University — analyzes the superb response of the medical community and first responders in treating the injured and conducting an investigation that quickly produced photos of the two suspects. Once the police located the SUV allegedly stolen by the brothers, Watertown officers cornered them and were in the process of subduing Tamerlan Tsarnaev. Then came the first mistake. Dzhokhar Tsarnaev attempted to escape in the SUV. Officers from other departments, called to the scene by an appeal for help from Watertown, opened fire on the vehicle. A police bullet likely hit and nearly killed MBTA officer Richard Donohue. The Kennedy School report finds that “in tactical situations definitive and authoritative command is an essential resource.” The Watertown officers, familiar with each other and the neighborhood, sorted out their responsibilities despite being under heavy fire. Chaos ensued once the out-of-town officers arrived. One officer riddled a vehicle with bullets, narrowing missing two officers inside; another shot grazed a transit police officer — the second and third gunfire mistakes. Officers with guns drawn surrounded a man walking in the area. Other officers, also with guns in hand, encircled the vehicle of another passerby. The report notes that this created “a potential crossfire hazard,’’ similar to that which resulted in the Donohue shooting. Intervention by superior officers possibly prevented another tragedy. The report recommends that the police determine procedures for “micro-command” when unacquainted officers are rushed together for an unfamiliar task. These procedures might have minimized the risk of a friendly-fire incident and facilitated the hunt for Dzhokhar Tsarnaev, who was at large for 17 hours. Once he was found hiding in a boat, a commander at the scene called for a small tactical team. Instead, officers involved in the search flocked to the scene. When Tsarnaev poked up the boat covering, the police sprayed hundreds of bullets in his direction. This was the fourth major mistake involving gunfire. The indiscriminate firing also put Dzhokhar Tsarnaev’s life in peril. Despite what one may think of him, he needs to go on trial so that the world can witness the quality of American justice. Public safety officials have not confirmed that Officer Donohue was felled by friendly fire, but accounts strongly suggest he was. Accepting that reality would be the first step toward examining the sequence of events in Watertown to devise training procedures that would reduce the possibility of accidental shootings in chaotic, pressure-packed situations. And the police also need to acknowledge the onrush of officers to the boat, without command authorization, was unnecessary and endangered the safety of innocent people. Governor Deval Patrick sent the wrong message last month when he praised the police for restraint because they heeded Evans’ command to cease fire. That order should not have been necessary if the officers had exercised good judgment and stayed at a distance. No one should question the courage of any officer who sought to bring the Tsarnaev brother to justice last April 19. Dennis Simmonds of Boston, one of those who responded, collapsed and died last week, perhaps because of the aftereffects of an explosive thrown by one of the Tsarnaevs. Bravery is not the only component of effective police work. As people in the education profession say, the gunfire incidents constitute a “teachable moment.” Public safety will be enhanced when police officers and their superiors throughout Massachusetts acknowledge and learn from the Watertown mistakes. Thomas Gagen wrote editorials for the Globe from 1987 to 2008.